Ed and I jive along in so many things, but when it comes to Japanese food, we're worlds apart! He'd go for ramen or teriyaki as I unleash the maki monster in me. Whenever I tell him that we're going to a sushi restaurant, he would always ask if there are offerings other than sushi. He wouldn't be happy if there's none, yet he'd eat whatever I eat anyway. No choice! Haha! I'd feel a little guilty though; hence, I was really hoping I could find a good sushi place where I could meet him halfway. And we discovered Chez Sushi! Chez Sushi is the casual counterpart of Sho Cho - a renowned fine-dining Japanese restaurant and lounge in Dubai Marine Beach Resort and Spa. Both created by the same people, Chez Sushi offers excellent Japanese food that mirrors Sho Cho's finest cuisines, but in a more laid-back atmosphere. It was a Friday night when Ed and I discovered Chez Sushi on the banks of the artificial canal in Dubai Marina. The location is awesome; it has an outdoor seating with a dazzling marina view and just a few steps away from Dubai Marina Mall. Most costumers preferred to dine al fresco, leaving the indoor seating almost empty. If only I wasn't after the good lighting for my food photos, I'd be dining outside as well! :) Well, actually, dining inside the restaurant isn't really bad as I got to experience Chez Sushi's funky atmosphere. 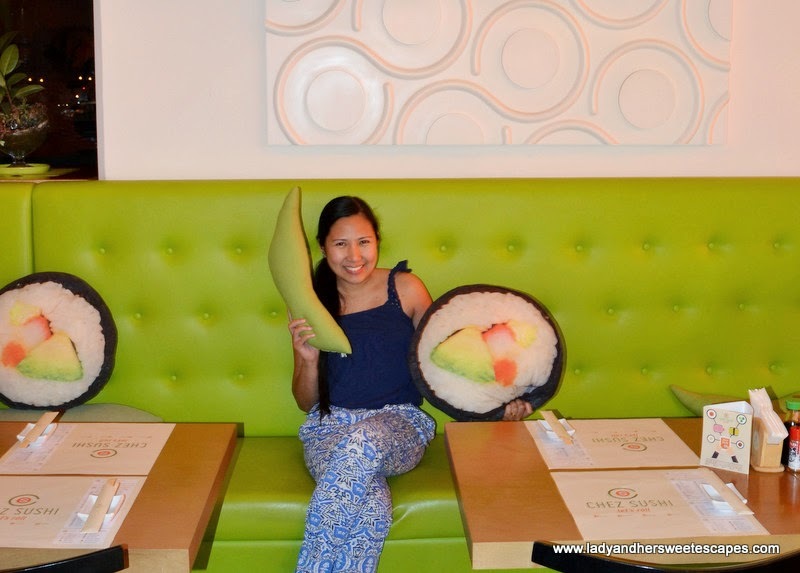 I lounged in a neon green sofa beneath the light fixtures that resemble Japanese rolls. I hugged pillows in the shape of edamame and maki while waiting for the edible ones to be served. The husband was delighted when he saw the menu. Despite the name, Chez Sushi doesn't have an all-sushi menu. The choices are extensive from appetizers to salads to mains! We also had Prawn and Coriander Gyoza; Japanese dumplings which are steamed then grilled. It's absolutely healthier and tastier than pan-fried. I love the flavorsome prawn and coriander filling and the soft, yet perfectly toasted on the sides, wrapping. Next served was the Calamari Salad with ginger dressing. Say ginger and my husband goes wild! But it wasn't only him who enjoyed the greens. I did! The dressing is super super good. It's tangy, lightly sweet and has that vibrant ginger flavor. The restaurant manager told us that Chez Sushi's sauces are homemade; mastered to perfection before it is introduced to the menu! That's why nothing in the market can ever match its taste! Chez Sushi truly dares to be different, and I love it! 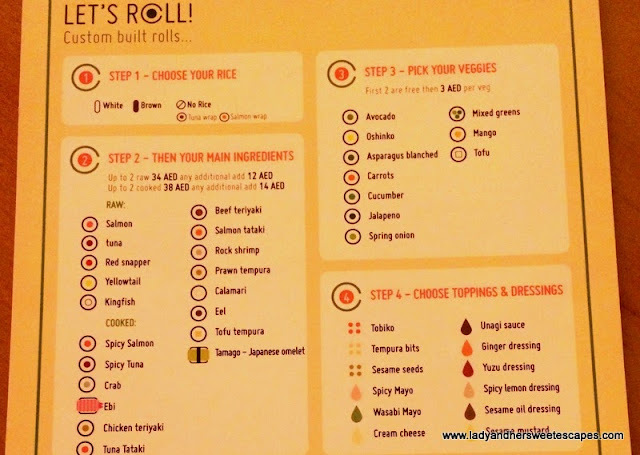 Aside from the signature rolls on the menu, there's the "Let's Roll" or the custom built rolls option. It's a wonderful concept as diners have the freedom to mix and match! There are four easy steps to follow when customizing your very own Japanese roll. First is to choose your rice; white or brown (huge YEY for health buffs) or none. For the no rice option, the roll is wrapped with either tuna or salmon. Second step is to pick the main ingredients. There are more than a dozen to choose from. Third step is to add some veggies. Choose from the basic ones like avocado, cucumber, mango, or from the interesting sushi pair-ups like asparagus, jalapeno, carrots. The fourth and the last step is to enhance your creation by adding toppings and dressings. Once you've made your choices, the team will then "roll" it for you! Fully satisfied on the appetizers, Ed agreed to save the teriyaki for next time. He had two kinds of custom built rolls with me. I created a special roll of crab and prawn (two of my favorite seafood) with mango and avocado, wrapped in white rice, dressed with Yuzu and topped with spicy mayo. I was a little more on the safe side, but I was so happy with my creation! I was curious with all the other options, so I happily dared the super accommodating manager to customized a roll for me using brown rice. I was over the moon when he agreed. He came back with a very unusual creation; salmon with cream cheese, mango and avocado wrapped in brown rice and drizzled with Unagi sauce! It's the texture of the brown rice and the richness of the dressing that made it so special and so different from all the Japanese rolls I have ever had! For my sweet tooth, we shared a serving of Mochi ice cream. It looks kawaii and tastes exotic! :) Each serving has three heavenly pieces perfect for a couple to share! We chose the popular green tea and two tropical flavors: coconut and mango. The rice cake wrapping is soft and delicate, giving the creamy flavors inside a chance to shine! please visit Chez Sushi's official website: www.chezsushi.com. *We were invited to dine at Chez Sushi - Dubai Marina branch (nearest metro station: JLT - red line). Although our meal was complimentary, this post is sincerely written and all opinions are my own. I love the healthy option! I tried the rock shrimp but it's a bit heavy for my taste so I think my fave is still the custom roll :) This Marina branch looks better than the more casual Jumeira's!